As we prepare for graduation on Monday, at UDC, I am sure our seniors are filled with emotion and memories. There is so much to recall. Times of laughter, such as when they dressed up in suits and petticoats for Ms. Seid’s Jane Austen tea party. And moments of solemnity, like visiting the 9/11 Memorial in Shanksville, Pennsylvania as a part of Mr. Hagerty’s history class. They will undoubtedly remember friends they made, some over four years, and others over eight years at our school, and the two trips to Camp Letts to build esprit de corps with their classmates and either accept to confer the mantle of leadership. Congratulations to the seniors for their hard work and for their accomplishments within and without the classroom. 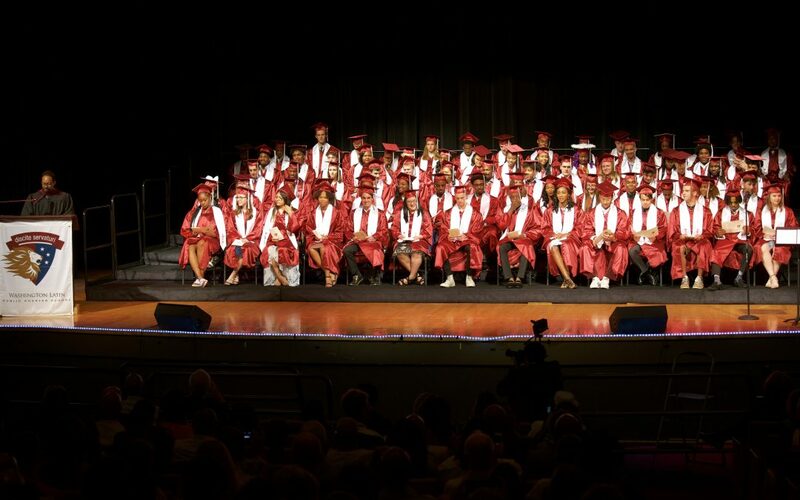 They have earned more than 6 million dollars in merit aid for college, including “Beat the Odds” and “Posse” Scholarships. The DC Public Charter School Board chose one member of the class to represent all students in the City who attend Tier One schools. Students in this class took Forensic Science at Syracuse, photography at Occidental College and college prep courses at Georgetown University. Some worked after-school and summer jobs as lifeguards, baristas, or ice cream scoopers. Others participated in internships, including one on Capitol Hill with a Texas Congressman. They also had stunning success in the athletic arena, earning All-State selections, excelling in playoff appearances and receiving numerous awards. One even won a Division I scholarship for basketball. Also, and equally importantly, our seniors learned about the importance of service to the broader community. They were “reading buddies” with fifth graders, mentors to eighth-grade students, peer mediators and tutors to middle schoolers. They made and delivered Valentine’s Day cards to senior citizens and veterans with Ms. Foster, and volunteered at the Gethsemane Baptist Church having lunch with senior citizens. They helped develop a program called Latin Soul, to volunteer to deliver cups of soup and hot cocoa to homeless people in the district, and they worked with a nonprofit called Little Lights to provide homework help. The lessons they have learned at Washington Latin will help prepare them for the next step in life. We hope to see the class of 2018 visit the school in future years, stay in touch with Ms. Eleby-El and actively participate in the new alumni organization that we are working to build. And who knows? Maybe a member of this class will return someday to work here. I think one or two have expressed an interest in my job. On behalf of the whole school, I wish the Class of 2018 the best of luck in all their exciting adventures!